We provide an organized and confidential process for homeowners in financial and personal need, to seek and receive essential home repair services in Northwest Cook and surrounding counties in Illinois. See details below for various projects the The Build Team has completed to help the community. We have approved new projects and are currently in the planning stages. We are looking for volunteers! Contact us if you would like to help and be part of the project team to Restore Hope. In the fall of 2017, we completed work to repair a major hole in the roof of a homeowner in Palatine. The work included a complete renovation of the interior room which had been damaged as a result of the roof leaks. In addition, we did substantial replacement and repair of the exterior fascia and soffits, made minor window frame repairs and painted an interior room. In response to a homeowner’s request to address essential work required by a local authority, a team of 10 volunteers worked on a Saturday in November 2017 to demolish and remove a large, exterior deck which was collapsing and endangering safety. The volunteers also removed extensive overgrowth around the home in order for the homeowner to comply with the requirements of the authority. In December 2017, as part of a project commitment to a woman in Wonder Lake, we replaced a failing hot water heater, toilet and did additional minor plumbing work. While volunteer work will complete the balance of the project in the Spring, this initial work was done for us by a licensed plumber who has been involved in several of our earlier projects. Over a three-week period in late August and early September 2017, we started and completed our work for a single woman in Cary who had lived in her home for 70 years. Over the years, she had opened her home to many of her extended family members, and her bathroom and kitchen were in great need of complete renovation. Working on weekends and some weekdays, our volunteers demolished the old bathroom and kitchen and rebuilt and equipped both as new. In addition to the complete renewal of her bathroom and kitchen, the Build Team engaged a well service company to install a new, in-well pump, which allowed for running water to again be readily available in the home. In total, our volunteers devoted 250 hours to complete this essential project. We responded to separate requests for help from elderly homeowners in Hoffman Estates and Schaumburg. In both of these instances, we provided what were limited repair services, but essential assistance in other areas. In Hoffman Estates, we recognized that the elderly homeowner (an 84-year old woman) needed major assistance in dealing with her insurance company. Among other assistance, we communicated on her behalf, obtained coverage and dealt with contractors who replaced her roof, totally renovated her family room. In Schaumberg, we identified that the elderly homeowner (89-year old woman) was immediately in need of replacing 40-year old appliances (washer-dryer) which were essential for her to be able to stay in the home. We utilized our contacts with a wholesale appliance dealer who provided the new appliances at the dealer cost. Over the last year, the Barrington community rallied around a young family confronted with the 24-hour requirements to care for their son born with Retts Syndrome. We took on the major role of providing materials and volunteers to do essential work to rebuild major portions of the home. The first floor of the home was rebuilt to a single level to permit the child to be present and engaged in the life of his family throughout the family eating and living areas. A specially designed bathroom was added adjacent to his bedroom, and an existing room was converted to a dedicated rehabilitation room. This rebuild and redesign is an important and significant assistance to the parents and nursing staff as they provide him with his required 24-hour care. The project began over the 2016 Thanksgiving weekend when our volunteers demolished the split level of the home and the hardscape patio surrounding it. Following this, excavation, foundation and work was done to frame a new kitchen, family room and upstairs master bedroom. Then, our volunteers worked almost every Saturday, some Sundays and many mid-week days for 4-months. They “tyveked” the entire new structure, installed the new windows and newly insulated the extensive new areas. We hung drywall on the walls and ceilings of the main floor and upstairs hallway, and added the trim and molding. Extensive work was done on the garage “pass through” and a front deck was constructed. Finally, volunteers did additional carpentry work, and primed and applied two coats of paint to entire first floor interior and the upstairs hallway. We completed our work in early July, 2017. The Build Team volunteers contributed 1,644 hours of work. They were present, willing and able to do what was necessary, planned how to and then to do it, while The Build Team was able to provide the essential materials to get the job done. Take a look at our latest video, A Mission for Madden. In doing the exterior repair work, it was apparent that the home needed gutters to avoid a repetition of the damage in the future. In the summer of 2017, we did the necessary planning and contracted with a gutter company to do the actual installation. 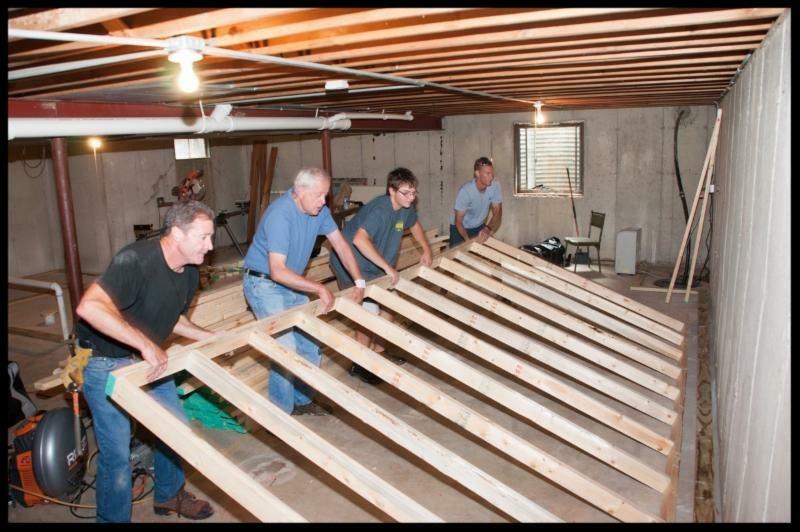 The Build Team helped a family in Chemung, Illinois, which is near Harvard. While the location was at the edge of our geographical scope, the family circumstances and needs were compelling. The husband suffered a traumatic brain injury as the result of a sudden medical attack. He has been completely bedridden and effectively paralyzed from the injury. While his wife works, their financial situation is such that they are not in a position to do the necessary repairs to their home. We visited the couple, reviewed their repair needs, and determined the scope of essential work and related budget. We started with an email request to our volunteers for a work-weekend on September 10 and 11, 2016. Thankfully, we received an amazing response. We had 30 volunteers come and help us! They had a mix of all skill levels and were able to accomplish quite a bit, including both interior and exterior work. • Completed a major exterior clean-up. The Board approved a project in late 2015 for a family in Barrington who met our need criteria. With the help and generosity of Ahrens & Condill, a local HVAC contractor, they agreed to arrange for the donation of the new furnace (by Munch's Supply of New Lenox, Illinois), as well as all installation. This was completed at no cost to us or the homeowner. This remarkable generosity is another, inspiring example of the special willingness of people and companies to meet the needs of others. During our on-site review of the proposed project, we determined that the most pressing need was to provide for a completely renovated bathroom. Due to recent water damage, the state of the repairs was critical. We recently completed this project and the family now has a new, full bathroom. We recently completed a project in North Barrington whose family was faced with financial hardships and personal consequences of the mother's battle with an aggressive cancer. She wished to have a play area for her four children and a bedroom and bathroom for her teenage son. Soon after we had started the project work, she lost her battle. While we were not able to complete her wish before she died, we finished it this year. 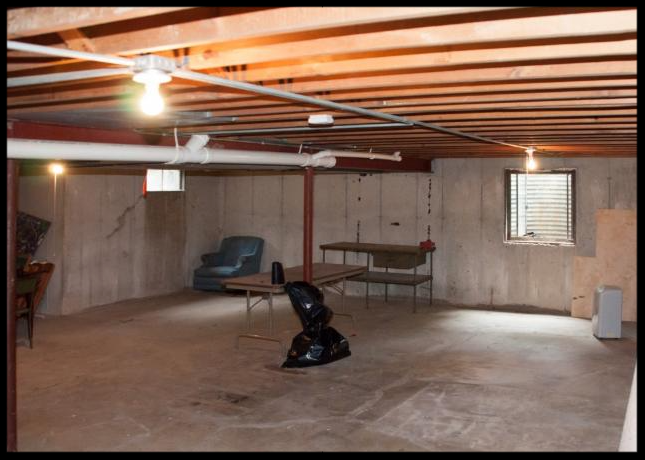 The family is now using the space and the son has his bedroom.The raw basement space was framed, insulated, dry-walled, primed, painted, all electrical and lighting was installed. 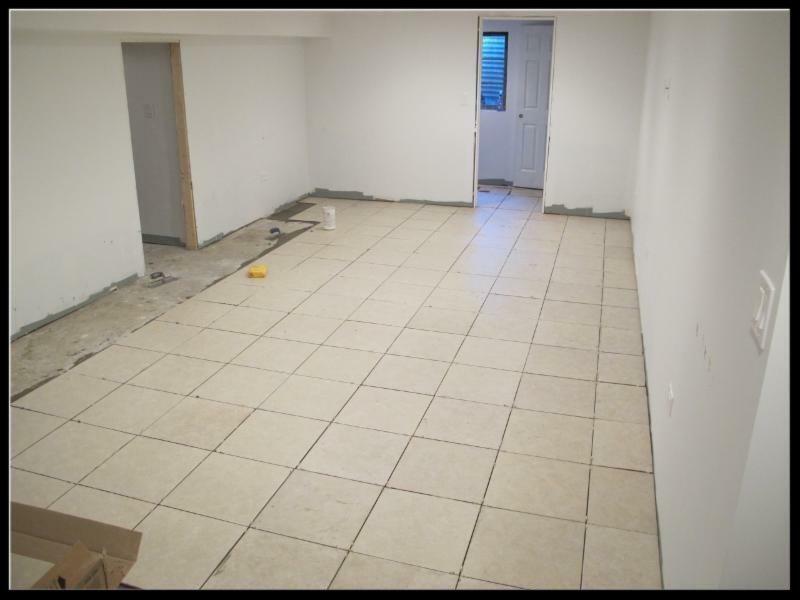 In addition a new tile-floor was installed, grouted and sealed. Of particular note is that 26 people contributed volunteer services to this project. In addition, Ford Plumbing of Lake Zurich donated the labor and plumbing supplies, while Ferguson Enterprises supplied the ejector pump. In mid-2015, we approved a project for a couple in Cary. The husband has cancer and the wife works two jobs. The walls and ceilings were newly-insulated, drywalled, and painted. Window trim and floor moldings were installed. Carpentry work was completed to provide laundry and closet space, and to divide the kitchen and living space. The kitchen was completely redone with cabinets, countertops and sink and discounted appliances to replace the old stove and refrigerator. New floors were installed in the kitchen and living room with carpeting used in the two other rooms. Plumbing work was done in the kitchen and in the laundry area which we equipped with a washer and dryer. Heating vents were cleaned, cold air returns reestablished, and the existing furnace serviced. Our work was substantially done by volunteers who committed 490 hours to help this very needy couple. While we were working on the home, the husband received the organ donation and the surgery he needed....he was able to return from the hospital to his "new" home. We particularly want to recognize the generous, volunteer assistance of ABC Plumbing, Heating and Electric of Arlington, Heights and electrician Tom Leonard, who devoted two, long Sundays and materials to help the family. 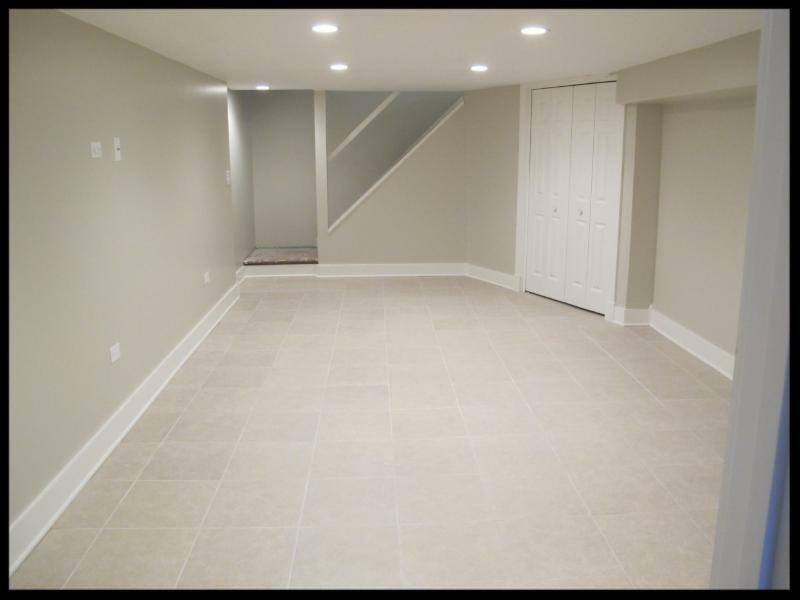 In December 2014, The Build Team started our second official project to help a home owner in Barrington with several improvements to her home. With her help, we converted her garage from a storage unit to a space that allowed her to park her car inside and also built new storage shelving which will help her to be more efficient with the work she does from home. Additionally, the broken garage doors were replaced with new weather proof doors, which made access more convenient. • A new sink and exhaust fan. “My experience with The Build Team was a life changing connection to people who care. I've been a struggling single Mom, with 3 daughters, since 1988. I am not at all good with a hammer or a drill. So, when things broke around here - I couldn't repair them. When the garage doors broke, we were unable to go in and out easily - so the garage hadn't been cleaned or cleared in many years. In the kitchen, we had broken cabinets and drawers, worn floors and a rotting sink area. I had honestly forgotten what it was like to have a nice living space! The Build Team came in, and were so friendly and nonjudgmental. They assessed the situation and gathered an amazing collection of volunteers - each with his own field of expertise and a heart of gold. The next project included the repair of a collapsed retaining wall. The homeowner has a disability that prohibits her from regular employment. The collapsing wall caused water to run onto her driveway, making it difficult to walk, drain or even driveher car during extreme weather. With the help of a local engineer, we designed a new wall to correct the issue. We recruited volunteers to work with the Engineer to remove and replace the existing retaining wall. In late May of 2014, a single mother in Cary completed our application for services. We promptly reviewed the application and scheduled a convenient time to meet her and review the needed home repairs. We learned that both she and her daughter had debilitating and progressive Lyme Disease and determined that her home was in need of essential repairs. With her, we prepared a scope of work which detailed what we would repair. After review of that scope of work and a proposed budget, our Board approved the application in June, obtained the necessary funding, and work commenced on August 2, 2014. Our completed these essential repairs and replacements which met the pressing needs of her family. Created an office area that enabled the home owner to work from home which included drywall, painting and heat. Added flooring to the Dining Room and the Living Room. Replaced, power washed, and stained the backyard fence. Replaced the hot water heater. Repaired and stained deck and stairs. Removed the upstairs carpeting and installed hardwood floors through out the entire second floor. The Mother and daughter were truly appreciative of the Build Team's lasting commitment to them. The home owner stated, “What a tremendous outpouring of time, hard-work, and dedication by so many- such a gift to my daughter and I that will make such a difference in our journey back to health and wellness. There is great relief to know the old, germ--laden carpet is out and there is now "clean" flooring that will not contribute to illness. We truly can't thank the team enough for giving-up an entire weekend, and staying so late on Sunday to finish the job. Such demonstration of sacrifice that we so, so appreciate."